A fish tank air pump is a good addition to your goldfish tank for several reasons. On an aesthetic level, adding air bubbles into your tank can create an eye pleasing effect that will draw more attention to your goldfish aquarium. To create the different air bubble effects with a pump, there are two variables that you should be aware of: the velocity of the air bubbles (how fast the bubbles are pushed out and how fast they rise. ), and the volume of the air bubbles (how big or small the air bubbles are). With this in mind, you can create large slow moving bubbles with long intervals in between, or, at the other extreme, a curtain wall of fast moving tiny bubbles. Now, before you start designing your goldfish’s new bubble effects, you will first need to take into consideration the nature of your goldfish in your goldfish aquarium. 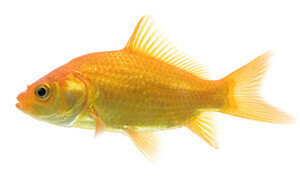 Are your goldfish small or large in size, and, are they slow moving carefree swimmers or strong active swimmers? If you have small or slow swimming goldfish, you might want to avoid a high velocity bubble stream. These types of goldfish can be pushed around by your tank pump’s bubble output. However, your strong swimmers will have no problem with this chosen effect and will even enjoy swimming back and forth through the air bubbles. If you have a mix of different goldfish types to cater to or you just really want to create a wall of air bubbles, place it in the back or along the sides to give your goldfish the option to play in it of avoid it altogether. By adding an air pump into your goldfish tank, you are doing three things to ensure the health of your goldfish. The first benefit is that you are now adding more oxygen into the aquarium water by forcing bubbles into water. Next, you are also helping to agitated the water surface which breaks the water tension which also increases oxygen levels in your goldfish tank. Lastly, these air bubbles can physically push the water around, creating more circulation in the water which helps with the exchange of oxygen and carbon dioxide.Goldfish need well oxygenated water with good circulation to be healthy and sometimes a large surface area is just not enough to oxygenate the water. This is especially the case if you are over stocked with goldfish or have an abundant amount of live aquatic plants. Over stocking of goldfish is easy to understand; each goldfish needs oxygen and the more goldfish the more oxygen required. The problem with live aquatic plants is that, yes they produce oxygen and eliminate carbon dioxide but at night they stop producing oxygen and will respire carbon dioxide instead. If your goldfish tank is not aerated enough to help eliminate this extra carbon dioxide, your goldfish can die. Most air pumps and filters should run around the clock. Question: I purchased a 2 gallon hexagonal tank for two goldfish for my daughter a few days ago(I have already become attached btw!). We have a water filter and airpump in the tank-both working well. (The tank is just a starter tank to help US become more accustomed with maintaining rather than jumping feet first into a huge tank since these are our first fish. )Our airpump seems to be putting out an enormous amount of air bubbles(we pushed it to the side of the tank but the fish swim through it and look like they get stuck and it’s scary! )My question is can there be too many bubbles in a tank or can the pressure be too strong? There are actually bubble sitting on top of the water about an half an inch high…not sure if this is safe for them…help! You can try buying an airstone to diffuse the bubbles and make them smaller. you might also try buying a longer tube. this will make it harder for the air pump to push out the air and result in slower bubbling. Some goldfish really like swimming through the bubble, like they are playing. Too many bubbles probably is never an issue but if the water current is too strong for a little fish, it might stress them out or make them ill.
To be build up in the filter media, 4 days even with fish is not enough, the fish you added would start of the cycle but at that time of adding the goldfish the cycle has just begun, you’re putting your fish through toxic poison such as ammonia, nitrite and then nitrates at high levels. Research properly first and do the fish a favour. Please read about fishless cycling, cycling with fishes is unhealthy and cruel, ignore any advise from fish shop staff who just want your money. It is important to have a cycled tank. See this post on goldfish tank cycling for some additional information. Does the air stone need to stay on 24 hrs a day? No, you could probably turn it off for overnight, but, if you don’t have a filter too, you might just want to keep it on all the time. It helps agitate the surface and increases oxygen levels. It also depends on how large or small your tank is, if you have a small tank with a small surface area on top, you might want to let it run all the time. those little pumps don’t use that much electricity. I have had my two goldfish for about a year and have watched them grow into their mature size.I have an air pump that goes down the middle of my fish tank but if i put the air pump all the way down the tank, the bubbles stop flowing. I have scrubbed the air pump and blew through the pump and it seems to be fine. But for some reason I have to keep the air pump towards the middle of the tank for the bubbles to flow. This has never happened before and am not sure what I should do. Maybe a new air pump? Also, I believe I have a common and fantail goldfish and they have been staying at the bottom of my tank the past two days, not moving much. It doesn’t seem like they are sick, maybe the water is too cold? I’m not sure if there is such a thing as the water being too cold? They’ve never really done this before. They seem more active at night however. I would be very appreciative for some answers! Thank you! yeah, usually when an air pump starts to go, it will lose it’s power and ability to push out enough air. You might need a new pump. Goldfish actually prefer cooler water and you actually don’t even need a heater. Goldfish will become less active when the water drops but this is okay. See this post on goldfish water temp. Perhaps they are more active at night because there is less activity and noise to stress them out. Add some more things to hide in or swim behind. I have a 30-35 Litre Bio-Orb tank that I have cycled for 4 days with 3 small tetras in it. The air pump in the middle blows out lots of bubbles and even the tiny tiny tetras have no problem with swimming around it. I added a Ryunkin after 4 days and he just stayed at the bottom, hidden in the plants unless I turned the pump off. When I turned it off, he’d swim around fine and eat and be active. He is a big fish so he had no problem swimming against the currents. I thought maybe he was lonely. I added a black moor a week later and the exact same thing has happened. the black moor is a little smaller and has no problem swimming but when the air pump is on, only the small tetras swim around. the two gold fish hide in the plants until the pump is turned off. Why is this? Is the pump strength or vibration scaring them? Int he aquarium, smaller fish were int he exact same tank and they had no issues. yeah that’s a bit odd. A Ryukin is a strong swimmer and not usually bothered by the presence of air bubbles. Sometimes it takes a while for goldfish to become comfortable with their new tank. This could be the cause of them to hanging out in the plants but it sound like it is like you said, the noise or vibrations from the air pump. I would first suggest getting a smaller air-stone to create smaller bubbles or turn the air pump pressure down if possible. I once bought a cheap air bubbler that only had one setting and so what I did was poke holes in the air hose (outside of the tank) to reduce how much air made it down through the air-stone. It seemed to help.